Natural progesterone, also known as bioidentical progesterone, is 100% the same as the progesterone hormone produced naturally in the body. What is the difference between Wellsprings creams and conventional HRT treatments? Why hasn’t my doctor prescribed natural progesterone? Are there any side effects associated with natural progesterone? How can a cream get natural progesterone into my body? Why does Serenity contain just progesterone and no oestrogen? Natural progesterone, also known as bioidentical progesterone, is 100% the same as the progesterone hormone produced naturally in the body. As such it is treated by the body the same way and can perform all the functions of the body’s own progesterone. Prescribed since the 1930s, it is used to treat menopause related symptoms and other conditions associated with hormone imbalance. It is important to recognise the difference between natural progesterone and the artificial progesterones (progestins) used in common HRT treatments. While in some ways progestins perform in the same manner as natural progesterone they are in fact chemically different and thus not treated by the body the same way. This is believed to be behind the reported side effects of common HRT treatments. >> What is Oestrogen Dominance? Where do I apply the cream? 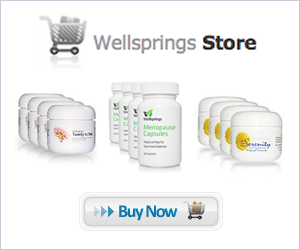 How should I use Wellsprings creams if I am menopausal and no longer having periods? Why do I need to take a 6 day break from the cream each month? What should I do if I am using my Wellsprings cream but experience an increase in oestrogen dominance symptoms?